Burstein and Black then present examples of each of these structural models. 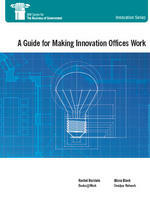 In addition to describing models for innovation offices, the authors identify issues that government leaders should consider in their decision to create a new innovation office, along with critical success factors for building and sustaining effective innovation offices. The authors emphasize that government leaders should not make the decision to set up an innovation office lightly, and should not create an innovation office for symbolic reasons. Rather, moving forward with setting up a center of gravity for innovation should follow a careful assessment of the mission of the new office, financial resources available, and support from key partners. Gwanhoo Lee examined federal ideation programs now in place throughout government in which ideas from government employees are sought and processed (Federal Ideation Programs: Challenges and Best Practices). Kevin Desouza examined the use of the Challenge.gov platform in which federal government agencies sponsor challenges with financial rewards to find innovative solutions to government problems (Challenge.gov: Using Competitions and Awards to Spur Innovation). Sandford Borins examined the use of awards to stimulate innovation in government (The Persistence of Innovation in Government: A Guide for Public Servants). We hope that government leaders interested in innovation at the federal, state, and local levels will find the models and success factors described in this report helpful as they consider future innovation initiatives or expand upon current innovation activities. Read the article in TechRepublic. Read the article in GovFresh. Listen to Chris Dorobek's interview on GovLoop. Listen to the interview on The Business of Government Radio Hour.